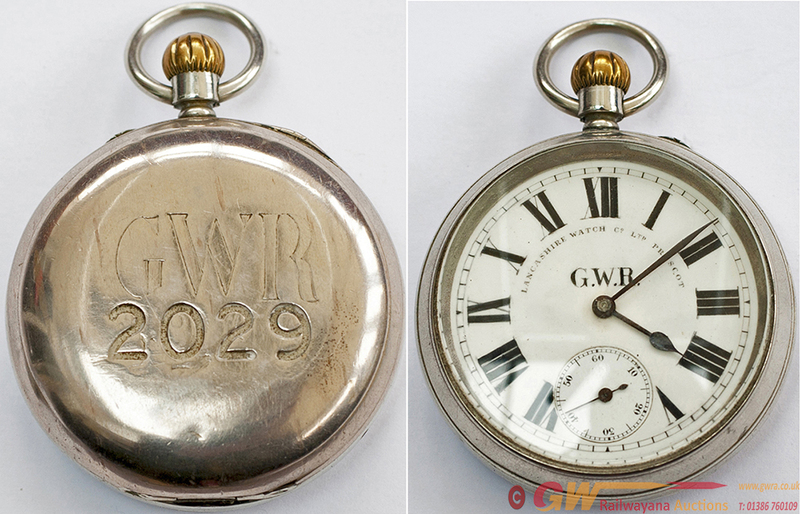 GWR Pre-grouping Pocket Watch, by the Lancashire Watch Co Ltd Prescot. A good quality English made watch with top wind and lever set for time adjustment. The dial is free from chips and has GWR enamelled below the XII position as well as the makers name. The good quality Nickel case has matching numbers 230 to all parts and the back of the case has GWR hand engraved onto it and the number 2029 machine engraved, the numbered movement 328340 is fully signed Lancashire Watch Co Ltd Prescot & London and the records show that this was made with 4 pairs of extra jewels and supplied to the GWR on the 15th March 1900. In fully cleaned and working condition, this type of watch is the rarest GWR pattern of all.